Diamondback Terrapin #825 came ashore Thursday afternoon, July 9th, on a private beach in Wareham, MA. 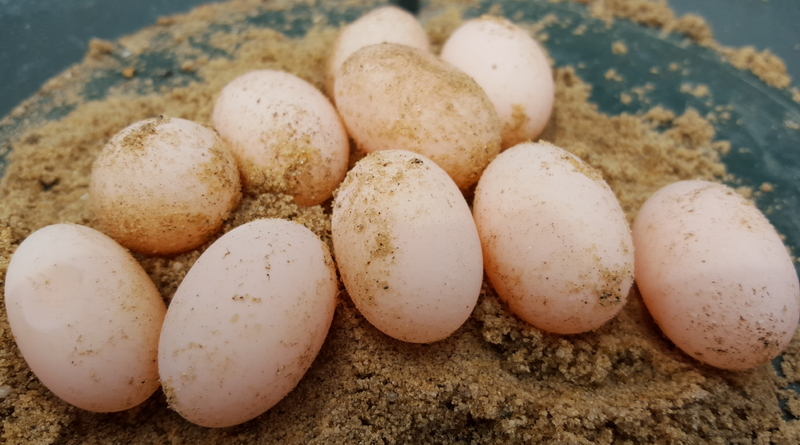 She deposited a nest in a sand-enhanced “turtle garden” adjacent to the beach; 13 beautiful pink eggs weighing a total of 100 grams. Michele Zollo waited for momma to cover her nest, and then scooped her up for the Turtle Journal team to document. BIG SURPRISE! This day marked her THIRD confirmed nest in 2015. Terrapin #825 nested with the earliest tranche of terrapins in early June, depositing 14 eggs at this “turtle garden” on June 4th. Nineteen days later, #825 returned on June 23rd to lay 12 eggs in a nest very close to her first clutch. Now, after an interval of 17 days, #825 dropped 13 eggs in the same “turtle garden” for a total of 39 eggs in 36 days! 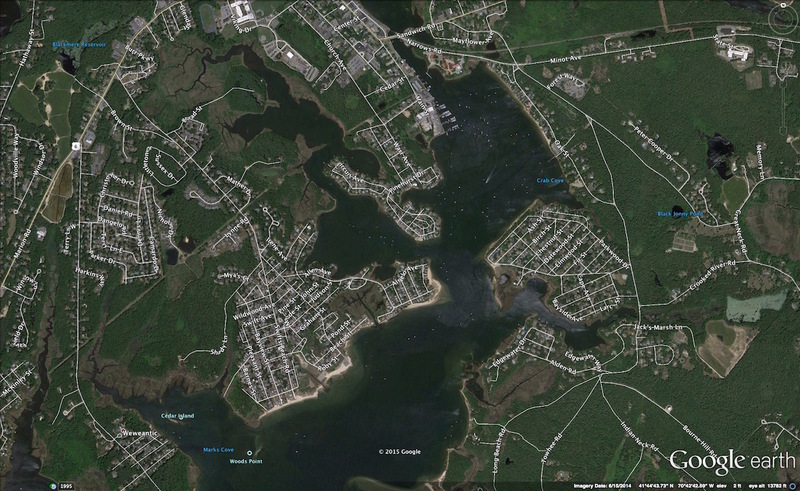 We had never before confirmed a triple nester on Massachusetts SouthCoast. We had speculated; we had inferred the possibility, but July 9th marks the first time we have actually had the same turtle in hand for physical confirmation of three nests in one season. Exact identification proves critical in definitive confirmation of events such as these. Terrapin #825′s facial skin markings are quite unique in the SouthCoast system and are easily recognizable, as is her extremely “feisty” behavior. However, a bit more empirical are her “numerical” marks. Etched with a triangular file in her marginals are marks that we interpret as #825 in our system of marking; see the image immediately above which can be expanded by clicking. Each turtle in the Buzzards Bay population has a unique number. The line through the nuchal (split nuchal), the scars on her first left costal, and the nick in the “10″ marginal provide additional confirmation of her identification. Digital images at each capture re-confirm these markings, just as digital photographs of her plastron reinforce her identification. We also take six morphological measurements of length and width at specific points of her carapace and plastron, as well as her girth and her weight at each capture. 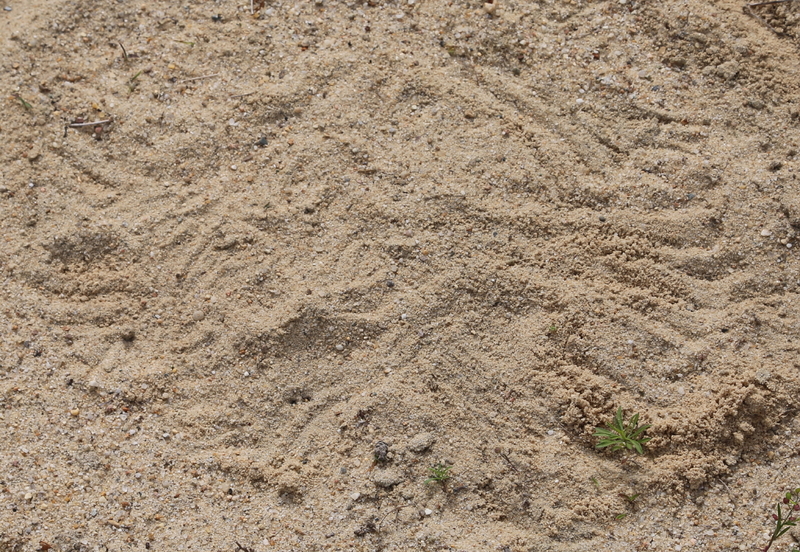 In addition to the scientific data these measurements provide, they also confirm Terrapin #825′s identification. 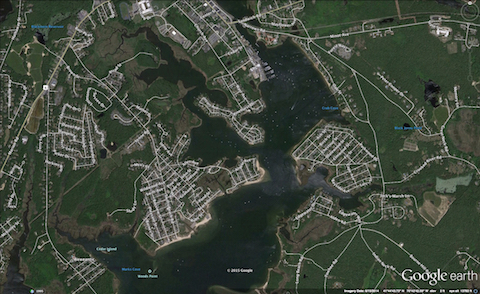 Terrapin #825 lives in an extremely protected estuary system off Buzzards Bay in Wareham, Massachusetts. The habitat is called Broadmarsh and lies near Swifts Beach. This area is so well protected that it warms up quickly in the spring, coaxing the first local terrapins out of winter brumation and inspiring the earliest nesters to come ashore. A few years ago Michele and Louis Zollo, recognizing that their private beach served as an important terrapin nesting site, augmented the habitat with several tons of sand, creating a safe and inviting “turtle garden.” Michele carefully watches her girls as they waddle in from the bay to deposit eggs from late May through the middle of July. She calls the Turtle Journal team to document the terrapins, and Michele protects nests with predator excluders to save as many of these hatchlings as possible. In late summer, Michele releases them into the abutting nursery salt marsh. On June 24th, 2013, an unmarked female terrapin, later marked #825, crawled ashore to nest in the Broadmarsh “turtle garden,” probably for her second nest of the season. The next time we saw Terrapin #825 was June 26th, 2014, when she placed a nest with 15 eggs in the “turtle garden,” again likely her second nest of the season. This 2015 year proved a special year for #825 or at least her research colleagues. 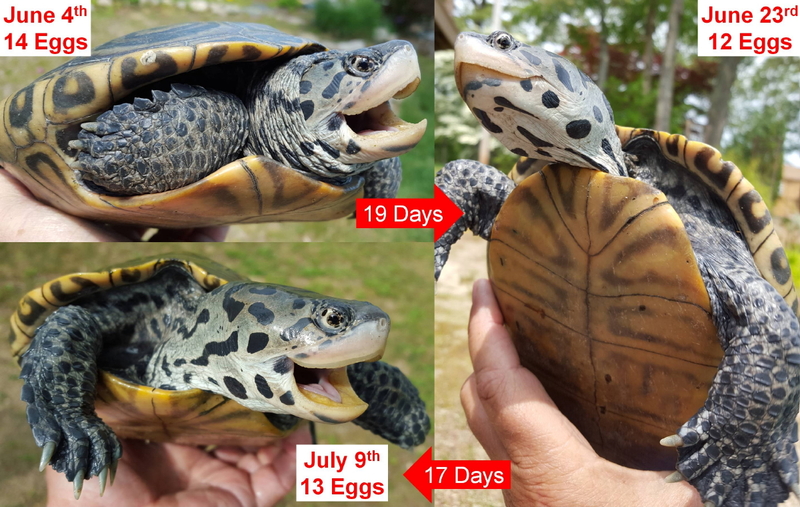 In the 36 days from June 4th to July 9th, she deposited 39 eggs (~313 grams) in three clutches of 14, 12 and 13 eggs, respectively. She became the first confirmed triple nester on the SouthCoast of Massachusetts. NOTE: The average clutch size in Massachusetts is 12.5 eggs which we round up to 13 because half eggs are tough to come by (smile). The normal number of clutches per year for Massachusetts terrapins is two. So, #825 maintained the same clutch size while laying an extra third nest. June 4th, Terrapin #825 at a mass of ~1409 grams came ashore at the Broadmarsh “turtle garden” as only the second nesting terrapin of the year at this site; a leading edge lady. The first nester at this site had beaten her by 30 minutes. 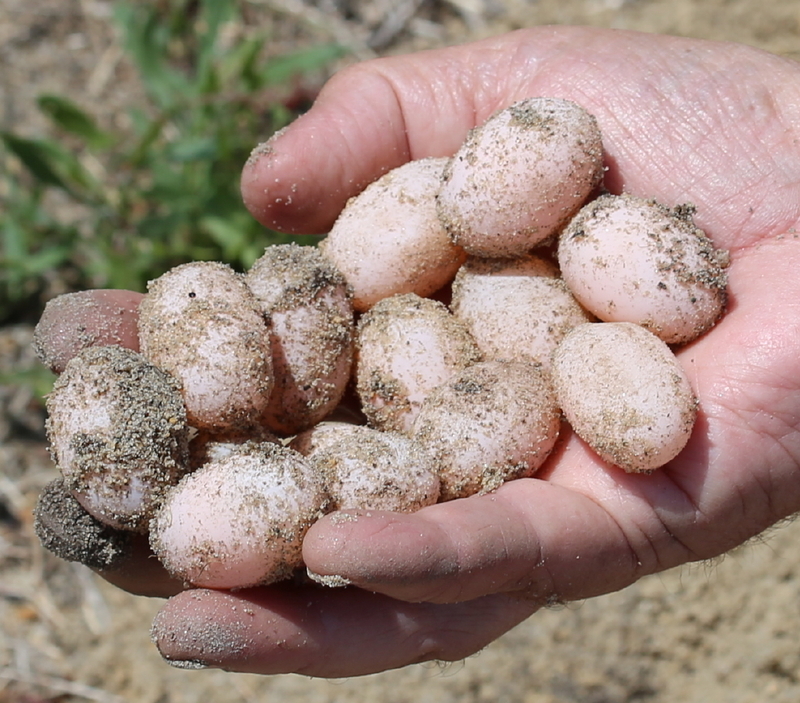 She deposited a clutch of 14 eggs and returned to the bay at a mass of 1297 grams. June 23rd, Terrapin #825 at a mass of ~1378 grams came ashore at the Broadmarsh “turtle garden” for her second nest of the season. She deposited a clutch of 12 eggs weighing a total of 101 grams in a nest very near her first nest. Her egg chamber stretched from 5 inches to 9 inches below the surface. She returned to the bay at a mass of 1277 grams. 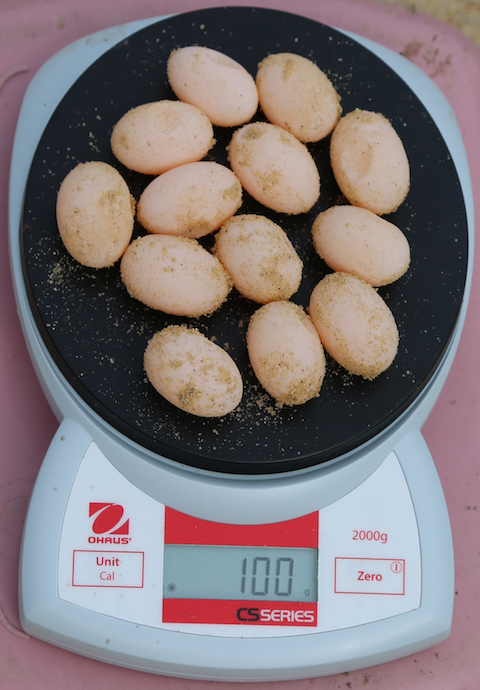 NOTE: For comparison, in 2014 #825 weighed 1186 grams after depositing a second clutch of 15 ~8 gram eggs. Her mass coming ashore would have been ~1306 grams. INTERVAL: 19 days between first and second clutches. The average interval between clutches for Massachusetts terrapins is 17 days. 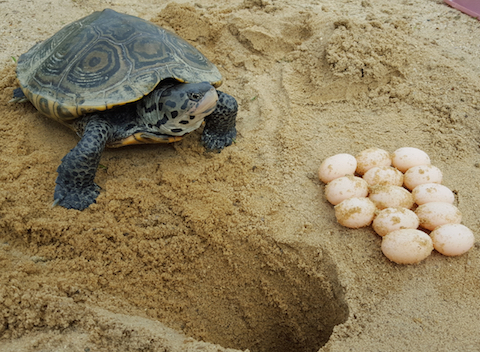 July 9th, to the surprise of all, Terrapin #825 at a mass of ~1335 grams came ashore at the Broadmarsh “turtle garden” to deposit her THIRD NEST of the season. 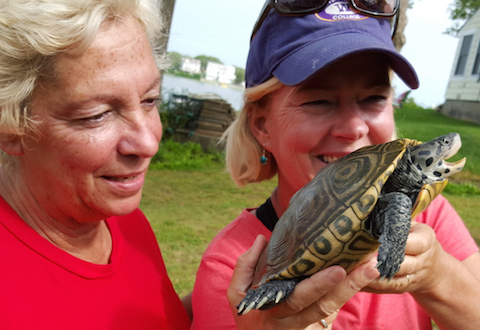 She is the only diamondback terrapin to be confirmed as a triple nester on Massachusetts SouthCoast. She dropped 13 eggs weighing 100 grams in a nest a few feet away from her previous two nests. She returned to the bay at a mass of 1235 grams. INTERVAL: 17 days between clutches. Her 12 second clutch eggs weighed an average of 8.4 grams each; her 13 third clutch eggs averaged 7.7 grams each. Her mass investment in the first clutch was 8% of her weight, 7% for the second clutch, and 7.5% for the third clutch. From her initial mass of 1409 grams to her ending mass of 1235 grams after three clutches, she lost a total of 174 grams while investing 313 grams into her clutches’ egg mass. So, during those 36 days, she also “gained” 139 grams in dietary in-take to make up the difference. 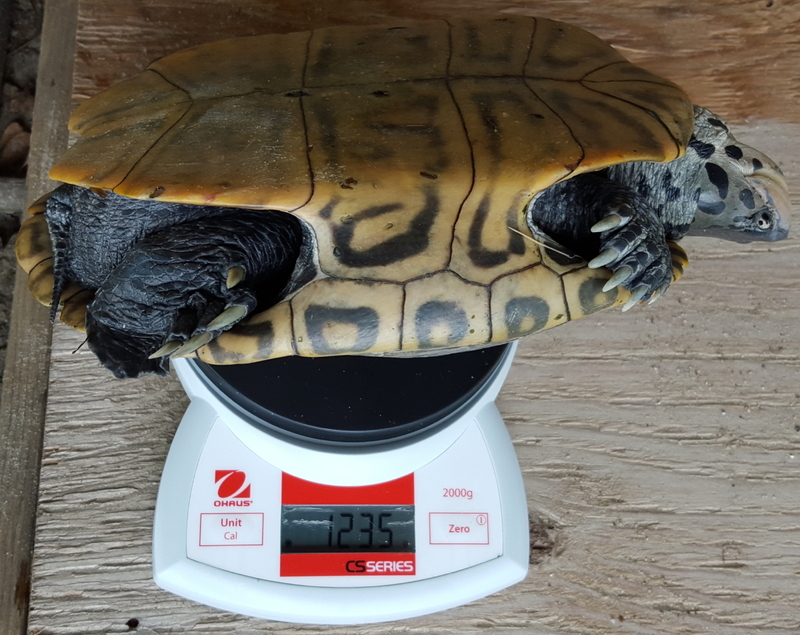 Terrapin #815 averaged a gain of 4.3 grams a day from June 4th to June 23rd, and 3.4 grams a day from June 23rd to July 9th. NOTE: In considering whether this triple nester represents a special situation, an isolated case or her normal nesting pattern, we should keep in mind that the 2014-2015 winter was cold, snowy and long, and that the 2015 spring was delayed. Nesting on the SouthCoast began on time at the very end of May, neither early nor late. Confirmation of a triple nester within the SouthCoast terrapin population brings into question certain assumptions about northern-most terrapin nesting and population models. 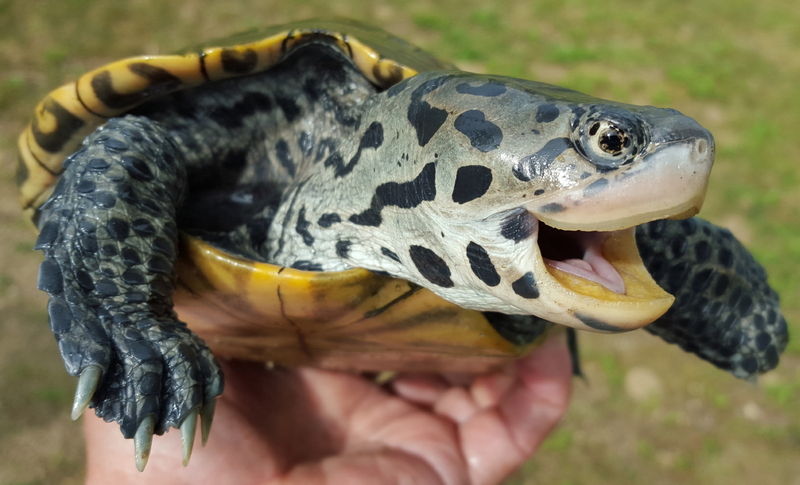 We will need to monitor very carefully other sites within Massachusetts terrapin populations to determine whether this phenomenon is simply a one-off event, or a rare situation, or perhaps relatively normal for the season’s earliest, leading edge terrapin nesters. 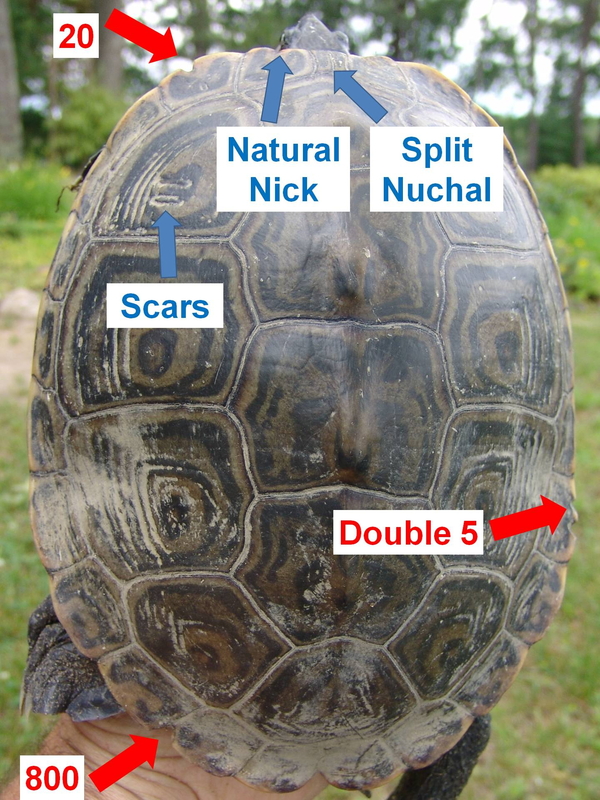 CAUTION: It remains extremely challenging to confirm a three-time nester, given that definitive proof for the first case had escaped our notice during three and a half decades of very intense diamondback terrapin observations within Massachusetts estuaries since 1980. You are currently browsing the Turtle Journal blog archives for July, 2015.